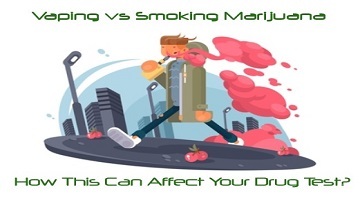 Vaping vs Smoking Marijuana – How This Can Affect Your Drug Test? I have recently received many questions from our readers about vaping vs smoking and how it might affect a future drug test. So, in this post I will sift thru the myths and facts to clear things up to allow our readers to be more informed. There is a consensus that vaping over smoking is a much safer way to consume marijuana. This is in fact true; when you consider the effects that smoking anything has on your respiratory system. When you smoke weed it releases more than just the desired marijuana components but a host of other by-products along with carbon monoxide that when inhaled can harm your lungs, throat, and overall respiratory system. When you vape only the main components of the marijuana plant will be released and at lower temperatures and since there is no combustion there will be no release of the toxic byproducts. Just to be clear, not all of the research is out on vaping, and it does not change the effects or inherent health risks of marijuana use in general. Another topic of concern, are the extraction methods of the raw cannabis plant itself. There are many, but we will save that for another post. What you need to know as far as testing goes is that the THC content in cannabis oil is 50-80% higher than what you would get from a high quality joint. How will this affect your detox and future tests? This will make it more difficult to detox quickly for those surprise tests. You will also have to deal with a much higher level of THC in your system which is the primary component they look for in drug testing. If you are carrying a few extra pounds like most of us are the THC will be stored in your fat cells just like that big Mac you had for lunch and make it even harder for you to clean up quickly. And in fact can add many extra days and much more effort to your detoxification process. There are four different ways in which you can be tested for THC. I am sure that most of you are familiar with most if not all of these. Saliva drug tests are probably the easiest to pass. This one only requires that you abstain from use for at least 48 to 72 hours if you vape and 24 hours if you are a smoker and involves only heavy brushing and a strong mouth wash and you will usually do well. If you don’t have 48 hours there are a few alternatives such as Toxin Rid Rescue Wash Mouthwash which has proven itself effective and chewing gums that are pretty much hit or miss. If you are vaping, THC can be detected in your blood drug test for an extra 2 to 4 days over smoking 3-7 days. If you don’t have that many days to wait to clean up, Toxin Rid whole body detox program is an effective product to reduce this time. You will have at least one or two days of shipping time to deal with and it does not come cheap. Unfortunately detox drinks are not effective in reducing your THC levels for blood tests. So don’t waste your time or money on them. Results and detoxing times are dependent on the potency and the amount consumed. If you are a very light user and vape you can expect to clean up naturally in 5-7 days, where as a smoker will usually clean up in 4-6 days. If you are a moderate vape user you can expect to wait 12-15 days to only 10 days for a smoker. If you are a heavy user using top shelf stuff and vape you can expect to wait 45-100 days compared to 30-70 days if you are a smoker. Of course there are many other variables that will affect the exact time you clean up beside the potency of the weed like your own biology, eating and exercising habits. You can speed up your detox time by using detox products specifically designed to reduce THC levels in your system. I recommend Toxin Rid whole body detox programs which have an effective proven track record. I would also recommend getting more than a few home urine tests. These will help you gauge your progress as you detox. Hair drug tests will be challenging whether you vape or smoke and takes about 90 days to clean up. This is based on the amount of time that it takes to grow approximately 1.5 inches of clean hair that will be used for your test. Body hair grows much slower than heads hair. So, if you’re using body hair for your sample make sure you have plenty of time to grow it. But you have to remember that the clock does not start until you test clean on a home urine drug test to avoid recontamination. The Aloe Toxin Rid shampoo combined with the Macujo method has proven itself to be a very effective tool in cleansing your hair in preparation for a hair drug test. 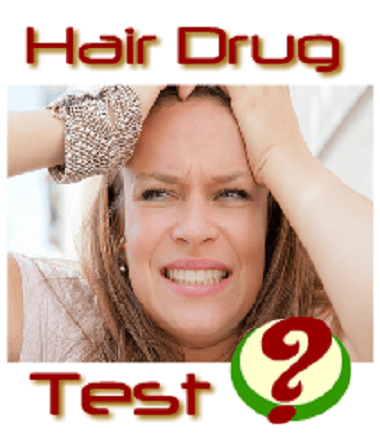 You can check it out here in our post “How to Pass a Hair Drug Test for Marijuana – 3 Effective Methods that Can Help You!” for more details. I hope that this has cleared a few things up as far as how vaping vs smoking marijuana can affect your drug tests, detox times and results. Thanks for reading my post. If you would like to leave a comment or question do so below or on my twitter line. We would love to hear from you especially concerning your experiences passing a urine or hair drug test. 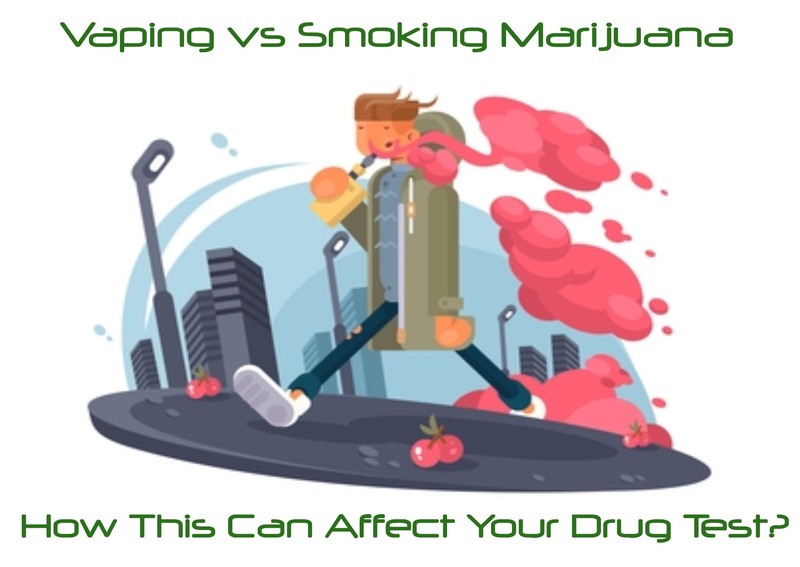 Vaping vs Smoking Marijuana - How This Can Affect Your Drug Test? I have recently received many questions from our readers about vaping vs smoking and how it might affect a future drug test. So, in this post I will sift thru the myths and facts to clear things up to allow our readers to be more informed. Thank you so much for sharing this useful post.. Sherryl..In your case, first you need to stop using marijuana until your hair drug test and try to manage your back pain in a different manor, try consulting with your doctor for the most effective treatment. Because of your very prolonged and heavy THC exposure, I would recommend performing a combination of 2 proven hair cleansing methods the Macujo and Aloe Toxin Rid Treatment methods with Ultra Clean shampoo on your drug test day. We always advise heavy users to complete the Macujo method as close as possible to the actual hair drug test day in order to avoid recontamination by THC-COOH. According to the instructions, the Macujo method should be performed at least 5 times in 3 days as close as possible to the day of the hair drug test. In your case, I would recommend performing as many Macujo methods as your hair and scalp can handle (10-14). Please read more details with our recommendations about the hair cleansing methods here. Lizbeth..If you had less than 24 hours since your last vape, your chances of passing your swab test would be 50/50. If you had at least 24 hours, you might have a chance to pass the test. i smoked a very small ammount of wax, maybe 2-3 hits monday, and my urine test is thursday. is there anyway i can pass? Joshua.. If you are a light or moderate user and it was your fist time smoking for a while, on your drug test day you might try using a detox drink like Mega Clean. By checking your THC levels in one hour after taking Mega Clean it will show if you can pass it or not. However, if you are a heavy user, I would recommend rescheduling your test and detox your body properly with a whole body detox program. Please read more details here. If you cannot reschedule and your test is unsupervised, we have seen that some users try using synthetic urine as their back plan. I have a drug test coming up sometime in the next month or two months. I smoked once a couple days ago, first time in 7 months, however it was 2 or 3 vape hits. You have in this article that vape hits are harder to avoid in drug tests than regular smoking. I am sure that I will pass a urine, saliva or blood test, but a hair test is what I’m worried about. I have read that one-time users are unlikely to test positive in hair tests, however vapes are more potent. What are my chances? Jack..I think you have a chance to pass your hair test as well. To be on the safe, I would recommend using an express home hair drug test in 7-10 days in order to check your THC-COOH levels. Don’t do it earlier as it usually takes from 3 to 10 days for the drugs to make their way into your hair follicles. Hey John, so I have a drug test coming up April 19th and the last time I smoked was March 11th. 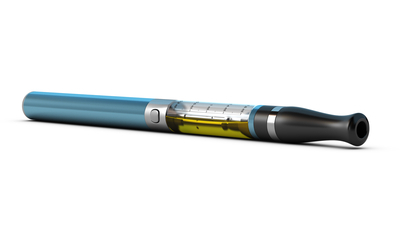 I almost exclusively would use my vape pen, but I would hit it about 5 or 6 times a day since around January. What are my odds looking like here? I have had such a hard time finding stuff online because I never smoked only vaped. Thanks! Alex..There is a good chance that you still test positive for THC because your everyday heavy THC exposure. I would recommend checking your THC levels tonight and go from there. If you still test positive, I would recommend rescheduling your test for as long as you can and consider completing at least a 10 day whole body detox program. Please read more details about the program here. If you cannot reschedule, on your drug test day you might consider using a detox drink like Mega Clean (60/40 chances though. We have seen that some heavy users try using synthetic urine as their back up plan, if the urine drug test is unsupervised. I have a hair follicle test coming up in about 3 weeks( give or take the date is not set quite yet). I was a regular user ( 1-2 times a day) and also hit concentrate pens as well as flower. I’ve been clean for about two weeks now. I plan on using the toxin rid shampoo as well as the Macujo method to clean my hair. Do you think a month of being clean plus the detox shampoo process will be enough to cleanse my hair of the toxins? If not how long should I wait to let my body/hair naturally get the toxins out before using the shampoo/macujo method to hope for negative results? Trey..First, you cannot cleanse your hair from the toxins naturally. This is why it is essential to perform the hair cleansing methods. Second, because of your heavy THC exposures, you might test positive for THC on a urine home drug test from 35 up to 90 days since your last use resulting in a hair recontamination issue until your hair drug test day. I think the best course of action would be to start using the Aloe Toxin Rid shampoo twice a day 10-12 days before your hair test and adding the Macujo method 6-7 days until your test. You should perform at least 12-15 Macujo methods. You should perform the Macujo method and use the Aloe Toxin Rid shampoo until your drug test day. Don’t forget using the Ultra Clean shampoo on your drug test day as well. After performing multiple hair cleansing methods, I always recommend using an express home hair test. (2 business days to get your results back). This will show where you stand and what you should do next. Hope this helps and let me know if you need more help. Do you think that’s enough time to pass? Erick.. I would recommend to stop vaping marijuana already today. This will give one extra day of cleansing your mouth. During those days you should brush your teeth and gums very well and use mouth wash like Listerine. In this case, you should have no problems with passing your swab test.